Here are some tips from RBTH to minimize travel woes and make the experience as painless as possible. Moscow has three main international airports: Sheremetyevo, Domodedovo and Vnukovo. From all of them can you can get to the city via the Aeroexpress Train or taxi. Please follow the signs to get to the Aeroexpress Station. If you have any trouble, go to the nearest Information Stand – the attendants there speak English, and surely will be able to assist you. The Aeroexpress Trains will take you to one of Moscow’s train stations, depending on which airport you leave from. Travel time is about 30 minutes. Tickets cost 340 rubles (7 euros or $10), and you can buy them from a vending machine just before train departure (credit cards are accepted), or to save time, buy your tickets in advance from the Aeroexpress website. If you prefer, you can grab a taxi. You will need to order your vehicle in advance; otherwise, you run the risk of becoming a victim of the privateer taxi drivers, who will aggressively offer you their services as soon as you leave the arrivals area. Ignore them. The official currency of Russia is the ruble, and payment in other currencies is not possible. You can change your money into rubles right at the airport, but not at very favorable rates. If you need cash to pay for your taxi (the average price from the airport to the city center is 800–1,200 rubles (17–25 euros or $ 24-35), and credit cards are not accepted), then change a small amount at the airport. After that, exchange the rest at a more favorable rate in any bank in the city. In Moscow, almost everywhere you can pay by credit card, with the exception of some small shops, subway ticket offices (!) and most museums. However, it is always best to have cash in your wallet, because if a bankcard terminal is not working at a store, you will learn this only when you reach the checkout counter: posting announcements about such problems is not done in Moscow. In addition, if the seller does not have change for a large bill, he/she will likely ask you to solve this problem yourself, in which case you will have to resort to using your bankcard. Ideally, if your office and hotel are located not far from each other in the city center, then you can walk between the two places. The territory of Moscow is huge, and trying to get to faraway places on foot is impossible. Alternatives are the Metro (subway) and taxis. Pros of the former are the speed and relative cheapness, cons are the intolerable stuffiness in the railcars and the huge number of passengers. The pros of the latter mode are obvious, but all these are nullified in monstrous Moscow traffic jams during rush hour. Rule number one: plan your meetings in advance and choose the appropriate times and modes of transportation. By the way, along with the “official” taxis, people in Moscow often use private “motorists.” You can flag down a car anywhere in the city, just go to the roadside and raise your hand in a characteristic gesture. The average price in the city is about 300 rubles (6 euros or $9). Keep in mind that when you travel with a private “motorist,” you are responsible for your own safety. Phone numbers of emergency services are given in the box. Moscow has no shortage of restaurants for holding business meetings. However, as far as good work spaces go, the city offers limited opportunities. If you need to rent an office for a few days, with all the necessary equipment, then take advantage of the co-working centers. 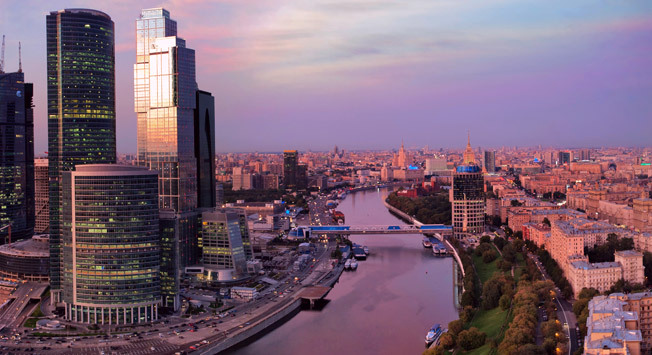 Recently, this concept has gained a lot of popularity in Moscow, so it will not be hard to find something suitable: for example, a strict office for a serious meeting in the business district of the MIBC Moscow-City, or the so-called creative space for creative work near a park. By the way, socket types C and F of 220 V are used in Russia, so do not forget the 220-volt adapter for your laptop. In Russia, a common three-digit number system is used to call different services in an emergency: Ambulance – 103, Police – 102, rescuers and firefighters – 101, 112.